Since this is our last Friday blog before Christmas, we want to wish you a happy holiday. It has been a year of ups and downs, but we are happy to report we ended the year on a positive note with the early feedback from the Holiday House Tour and Bough and Dough Shop. If you are looking for a last minute gift or two from our 2018 lineup of Bough and Dough Shop artists, we still have those with a website or Etsy store listed on our Featured Artisans page. The artists would be delighted to hear from you – let them know you found them through the Bough and Dough Shop, too! The page will likely stay up as-is until the summer or fall of 2019 as we begin to nail down the next artist lineup. We also still have the two feedback surveys open, the Shop and Artisan specific survey and the Holiday House Tour and Shop survey. Remember to be specific in your written comments, particularly in asking for types of items you would like to see at the Shop in 2019 (i.e., instead of saying “jewelry,” let us know what type of jewelry – metalworking, polymer clay, beaded, etc.). We will be reviewing the feedback in January of 2019. As always, the invitation for you to join the Holiday House Tour 2019 team stands so you can make the event more of what you want to see. The drastic improvement to the Shop in 2018 was due entirely to rethinking event from the ground up by one person from January to August after watching the process for two to three years. The same can absolutely be done for the Tour itself from anyone familiar with its goals and ambitions. We strongly encourage anyone who feels that the House Tour is not meeting their expectations to take your written feedback a step further and give back to this community tradition through action. Make this your New Year’s Resolution, become involved as one of the volunteer leaders, and make the Holiday House Tour your dream event. Doing so will probably even give you more personal benefits than just producing a better event. You may leave your information as a volunteer by stating specifically you want to take on improving some specific part (some feedback included allusions to writing and submitting press releases, running an Instagram, being a house decorator to make sure it meets your level of “festive,” etc. – all are very welcome tasks for volunteer leaders) for the Holiday House Tour at phwinc.org@gmail.com, by phone at 540-667-3577, or by snail mail addressed to PHW, 530 Amherst St., Winchester, VA 22601. You do not need to be a member of PHW or join the board of directors to be a volunteer leader, but attending meetings to make reports, take suggestions, and give directions to PHW staff is critical, particularly in the final preparation stages of September-November. 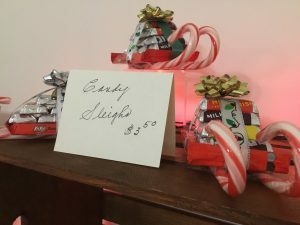 And just for fun, you might relive your childhood a bit with a short YouTube video of Andy Davis at the Johnson County Museum exploring aluminum Christmas trees in the era of America’s space race and futuristic fascination. We hope you were able to experience one in person if you went to the Patsy Cline Historic House during the Holiday House Tour weekend. While they may be a kitschy throwback, they remain highly evocative of the late 1950s to 1960s holidays. While they don’t work for all homes, if you have a “newly historic” home from the 1960s, you might want to think about trying an aluminum tree for some properly retro vibes! We are almost back to normal at PHW after the Holiday House Tour and Bough and Dough Shop. Along with the end of the event come feedback surveys. If you only visited the Shop, please take the survey specific to the Shop and artisan vendors. If you partook in the Holiday House Tour and Shop this year, please take the slightly longer Holiday House Tour feedback survey. We will review your feedback from both surveys in our wrap up meeting and initial planning for the House Tour in January 2019. Thank you for your honest feedback! Happy Friday! It has been a busy week for us at PHW wrapping up the Holiday House Tour, working behind the scenes on the website (this will be our first new blog post since updating to the latest version of WordPress, which has been a learning experience all its own), and winding down the Bough and Dough Shop. If you haven’t made it to the Hexagon House yet to see the shop, you are missing out! Be sure to drop in Friday or Saturday between 10 a.m. to 5 p.m., or Sunday between noon to 5 p.m. After that, the over twenty fabulous artists and their goods will be gone until next year! If you already made it to the Shop, we would love your feedback on the different format and hours this year. If you didn’t get a paper survey at checkout, you can find the online version at Survey Monkey. It is a quick four questions specific to the Shop (not the Holiday House Tour). Feedback from this survey will be used for our internal planning for the Shop as well as in finding, selecting, and directing artisans for the types of items they should bring in 2019. Thank you all, and we hope to see you one more time this weekend at the Hexagon House for the Bough and Dough Shop. Keep this survey in mind when you visit! Single site admission to 411 N. Loudoun, the Fort, will be $10 as it is a larger site than usual. Other sites will be $5 as usual for a single admission. Full tickets will be $25 each at the door on Saturday and Sunday. Be sure to bring cash or checks if you want to pay at the door; we will not be able to take credit or debit cards at the sites. We recommend stopping at Kimberly’s, 135 N. Braddock St., if you need to use a credit card at the last minute for tickets. Remember you can visit Patsy Cline’s House at 608 S. Kent as a bonus Holiday House Tour location for free. This is a special event taking place Friday, Saturday, and Sunday. Find more at their Facebook page. Representatives plan to be on site both Saturday and Sunday at the well at 419 N. Loudoun instead of Saturday only as earlier reported. This is an exterior visit only and may be impacted by weather. Walking tour groups plan to leave on the hour. The last guides will set out at 4 p.m. You do not need to join a walking tour group to take the house tours. If the weather is rainy Saturday, guides will not be leading walking tours. Update at noon: Saturday walking tours are cancelled for the expected inclement weather. Parking will be available at 203 N. Washington St., Centre Meeting House. Look for directional signage. The weather looks to be rainy on Saturday, but sunny and warm on Sunday. Be sure to dress for the weather and keep an eye on the forecast. 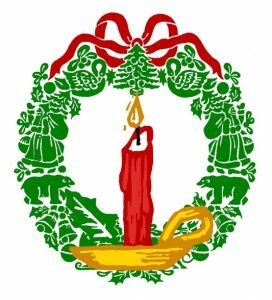 Look for carolers from Winchester Little Theatre on Sunday afternoon walking the neighborhood and spreading good cheer. Tickets are still available at the advance sale locations and on the website. If you order online, be sure to bring your receipt from Paypal as your ticket. Enjoy your Holiday House Tour weekend! 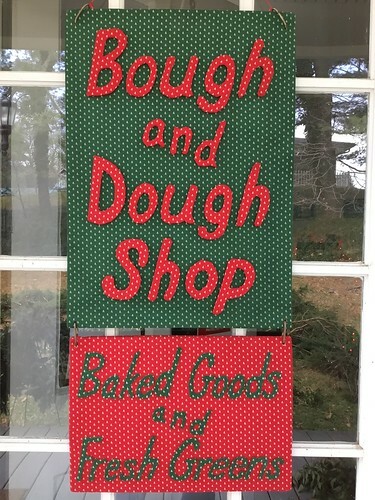 Don’t forget to stop in the Bough and Dough Shop at the Hexagon House, 530 Amherst St. The greenery has arrived, and a limited amount of wreaths are currently available. 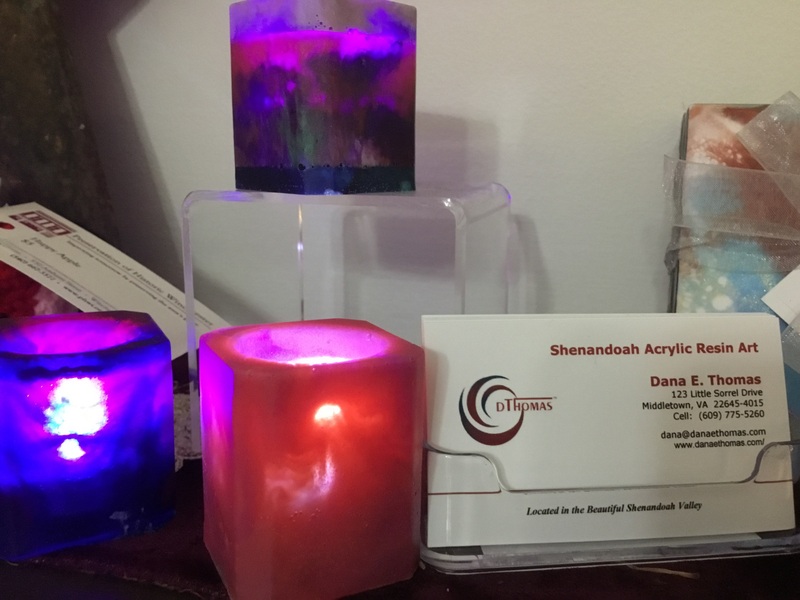 Dana Thomas of Shenandoah Acrylic Resin Art is a new artist at the Bough and Dough Shop for 2018. 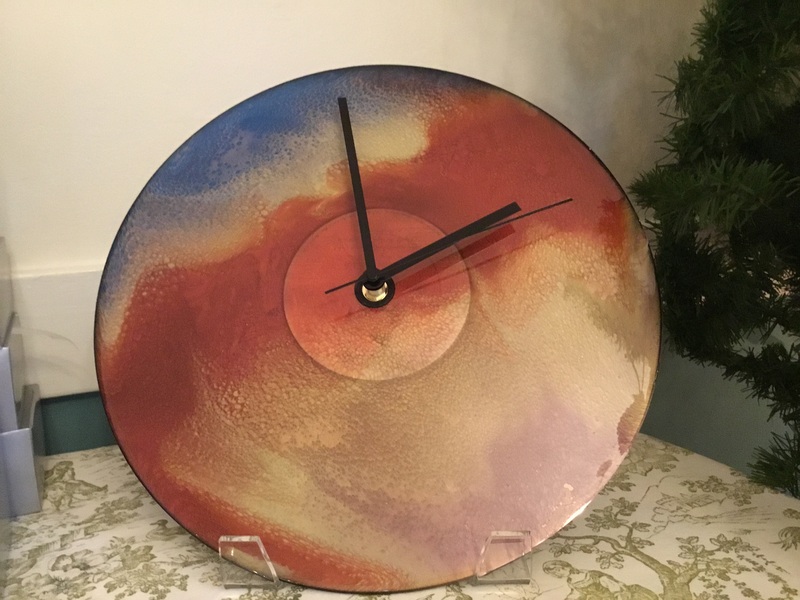 His work features bold and shimmery acrylic paint combined with resin to form abstract wall canvases, votive holders, wall clocks made on old LP records, and coasters and trivets both in clear resin and on tile. The photographs do not do his work justice; it is best seen in person in good light to reveal all the subtle touches. You can visit the artist’s website danaethomas.com. The Bough and Dough Shop is located at the Hexagon House, 530 Amherst St. in Winchester. The Shop is open Tuesday-Saturday, 10 a.m. – 5 p.m. and Sunday noon – 5 p.m. If you have access to the Winchester Star online, you can read two articles on the House Tour. The first is PHW’s Holiday House Tour is this weekend. For this article, please note representatives are planning to be on hand both Saturday and Sunday at the site of the well of Fort Loudoun, 419 N. Loudoun St. This stop is outdoors so may be weather dependent. The walking tours may also have a guide in the area of the former Conoco gas station at 501 N. Loudoun St. if you would prefer to walk downhill to the Loudoun sites. The Fairmont sidewalks are expected to be walkable by the weekend, but if not we may need to do last minute rearranging. Carolers from Winchester Little Theatre will be walking the streets in period attire on Sunday. This activity is also weather dependent, but Sunday’s weather forecast looks like this should not be an issue. 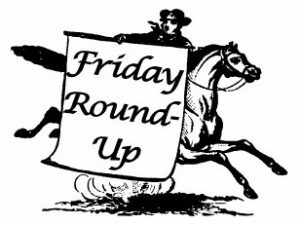 Look for them starting around 2 p.m.
You can also get a sneak peek at The Fort in the second article, Historic apartment building included on Holiday House Tour before you get to see it yourself this weekend. And one last minute update from the Shop, Donna Sheets dropped off some candy cane sleighs full of chocolate. You can pick one up from the Hexagon House this week during Shop hours 10-5 Tuesday to Saturday and noon-5 on Sunday.